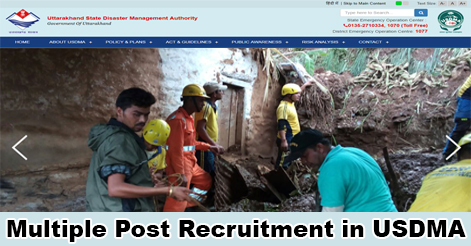 Uttarakhand State Disaster Management Authority (USDMA) has released an advertisement for the recruitment of Senior Consultant, Consultant, Assistant Consultant, Planner, IEC Officer, System Analyst, Geologist, and GIS Operator & Personal Assistant/Steno Posts. Total No. of Post is 14. Interested candidates may send their resume on the prescribed format on or before 27 Feb 2019. Interested candidates may send their resume on the prescribed format (given in the link below) with certified copies of the relevant certificates to the Executive Director, Disaster Mitigation and Management Centre, Uttarakhand Secretariat, 4 Subash Road, Dehradun – 248001 (Uttarakhand) so as to be received on or before 27th February, 2019 by post. “Application for the post of (Name of the post applied)” should necessarily be written at the top of the envelope carrying the application. Help us to improve this article/job posting "Multiple Post Recruitment in USDMA". We would be glad if you can comment below and provide your valuable suggestions and feedback. If this page have any wrong information/list or out of context content, then you can report us as well. How can i apply for this post? I have done Bachelor degree in tourism from ignou university and I want to make my Carrier in government tourism sector. I am trying to apply for GIS operator and I have completed my graduation in commerce and holding a degree of PGDDM (post graduate diploma in disaster management) from IGNOU,should I able to apply in the post..
Hi! I am an architect from Pune. Passed out in 2011. Currently unemployed. Looking for job opportunities in Hrishikesh that suit my qualification. I am open for non architectural jobs as well.